I set up two factor (or two step or 2FA) authentication on my WordPress.com account yesterday. It’s an extra layer of security: anyone trying to gain access to your account wouldn’t get in even if they found out your user name and password. That’s because you enter something you know (password) and something you posses – such as a code sent to or generated by your mobile phone. 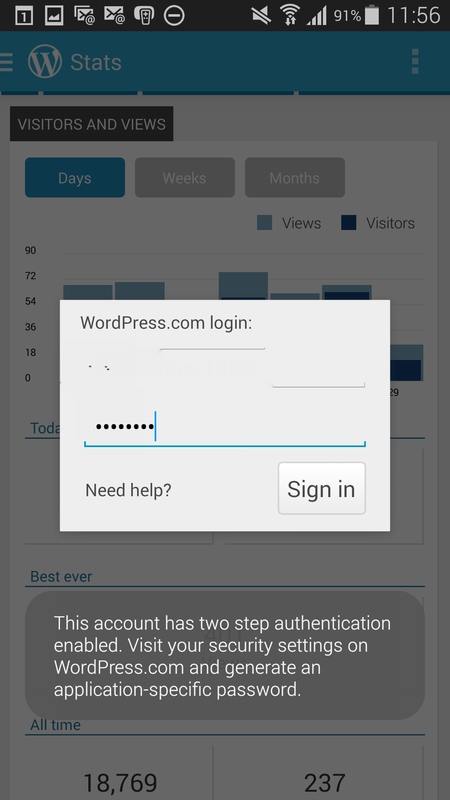 WordPress uses the Google Authenticator Android and iOS smartphone app, as well as some other options. I found it very easy to set up. But when I tried to access my WordPress.com account on my mobile devices, I ran into difficulties. Incidentally, you’ll need to follow a similar process if you apply two factor authentication for you Google accounts, such as Gmail. You can find more info on WordPress’s support pages. This entry was posted in Tech and tagged Google, two factor authentication, WordPress by Rob Skinner. Bookmark the permalink.